Often, I find myself in the tension of timing. So often, I find myself hearing someone or myself say, “In Gods Timing.” Sometimes, I find relief in that, but other times I feel like its a cop-out. Cop-out? Yes. As if we do not have the ability to make powerful choices for ourselves. Ecclesiastes 3: There’s a Right Time for Everything : There’s an opportune time to do things, a right time for everything on the earth: A right time for birth and another for death, A right time to plant and another to reap, A right time to kill and another to heal, A right time to destroy and another to construct, A right time to cry and another to laugh, A right time to lament and another to cheer, A right time to make love and another to abstain, A right time to embrace and another to part, A right time to search and another to count your losses, A right time to hold on and another to let go, A right time to rip out and another to mend, A right time to shut up and another to speak up, A right time to love and another to hate, A right time to wage war and another to make peace. Here’s the thing: There is a bigger picture. God is playing the big game. Our lives are not a game, of course, but his purpose for earth can go beyond our lives, beyond our community, and beyond our nation. Christ Jesus is the King of the Universe. At the same time, God is completely engulfed in our lives and knows every detail of what is happening physically, emotionally, and spiritually in us, in our families, in our communities, and in our nations by his great and powerful love. Let’s say God has a promise for your life. Since God is truth and Jesus is the word because the word was made flesh, Jesus/HS/God is incapable of lying. Incapable! It doesn’t fit. Jesus’ promises and dreams are given to us out of love and purpose. It is our honor to be chosen and to be given. At the same time, our lives on earth is a co-laborship. As God does we do. And! What we do God multiples. What I have seen in my life, and I want to encourage others to prevent, is the opening to a lie. When we are hurt, frustrated, and human, we go to God. We talk it out and learn the truth of whats happening, and God’s perspective in the matter. However, when we don’t, we are giving ourselves an opportunity to not hear the truth. Instead, we partner with self-doubt, shame, guilt, self-hatred, and abandonment. Jumping out of the boat, Peter walked on the water to Jesus. But when he looked down at the waves churning beneath his feet, he lost his nerve and started to sink. He cried, “Master, save me!” Jesus didn’t hesitate. He reached down and grabbed his hand. Then he said, “Faint-heart, what got into you? Those treacherous waters, which are patterns that have been taught to us to be viewed as “danger!”, are holding us back from the true miracle of our lives!!!!!!! The world is my ground, and to allow myself to submit to it’s patterns will only sink me. When I get butterflies in my tummy, instead of interpreting that as “I am so nervous” or “I am so scared” and allowing myself to get sick from it, I have created a pattern that says, “I am so excited for what is about to happen.” My spirit and my God knows that something awesome is about to happen. It’s anticipation! Thats what I grab a hold of. Like Jesus saying, “Come to me.” Despite the treacherous waters, and especially the behavior of other people, I focus my gaze on the beautiful eyes of my Lord and continue to be encouraged by his promises, his purposes, and his plan for my life and watch as the miracle happens! So, for my beautiful friends that are reading. If you are weary, and feel like nothing is as it should be, wait. Look to Jesus and give him that beautiful sacrifice of your praise. Believe that he is making all things work together for your good. He is creating the pathways for new thinking for all. Celebrate the victory before it has won, and watch as your path is cleared for you, watch as the steps become known, and watch as life abundantly transforms inside of you and around you. Overall, yes Gods timing is perfect, because he is perfect. He knows every detail of our lives, so it is not possible for him to have bad timing. The more we open ourselves up to his words about us, his prayers about us, his songs over us, and his healing into our lives, the more we will experience the kingdom of heaven on earth. He is an ultimate plan and is working around the clock on your behalf. Overall, you need have patience and realize that not everyone and everything is working the way you want it to right now. Follow the sensations of Holy Spirit and the word of God and realize what God is doing and follow his plan for the situation. It doesn’t always look like what we “think” it looks like. Honor him and what he has called you to in this season, instead of acting out in frustration and causing a bigger mess (he can still restore any mess we make though). I am blessed when I’m at the end of my rope. With less of me and my own selfish ambitions there is more of God and his rule. I am blessed when I feel I’ve lost what is most dear to me. Only then can I be embraced by the One most dear to me. 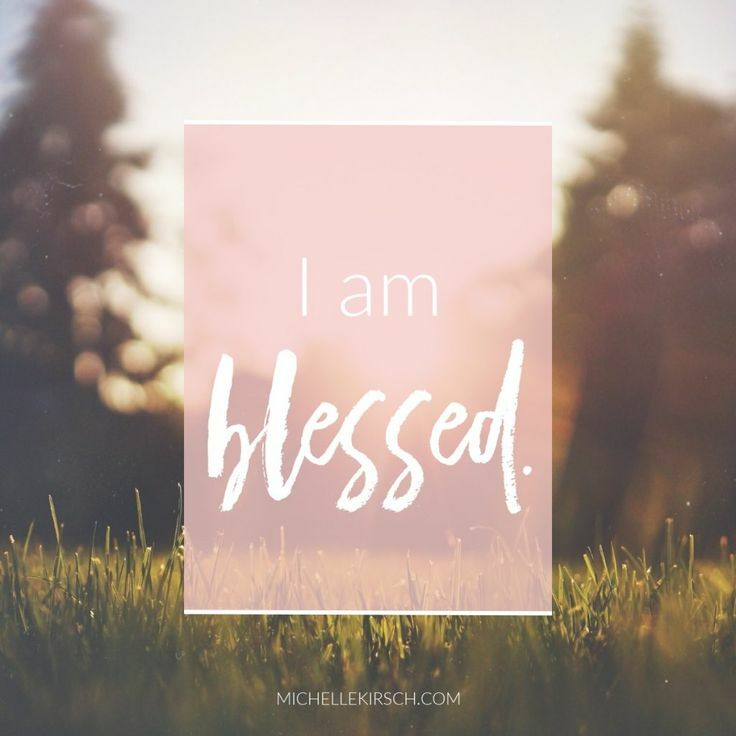 I am blessed when I’m content with just who I am—no more, no less. That’s the moment I find myself a proud owner of everything that can’t be bought. I am blessed when I’ve worked up a good appetite for God. His food and drink in the best meal I’ll ever eat. I’m blessed when I care. At the moment of being ‘care-full,’ I find myself being cared for. I am blessed when I get my inside world—my mind and heart—put right. Then I can see God in the outside world. I am blessed when I can show people how to cooperate instead of compete or fight. That’s when I discover who I really am, and my place in God’s family. I am blessed when my commitment to God provokes persecution. The persecution drives me even deeper into God’s kingdom. Not only that—I count myself blessed every time people put me down or throw me out or speak lies about me to discredit me. What it means is that the truth is too close for comfort and they are uncomfortable. I can be glad when that happens—give a cheer, even!—although I don’t like it, God does! And all heaven applauds. I know that I am in good company. My prophets and witnesses have always gotten into this kind of trouble. Be the God propelled you no matter where you are, and watch how the garden grows around you.